The following animation is a series of images of the diffraction pattern formed by a 130mm Newtonian reflector with 0.5mm spider vanes and a central obstruction that increases from 0% (by diameter) to 50% in 5% increments. The images span 60 arcseconds. 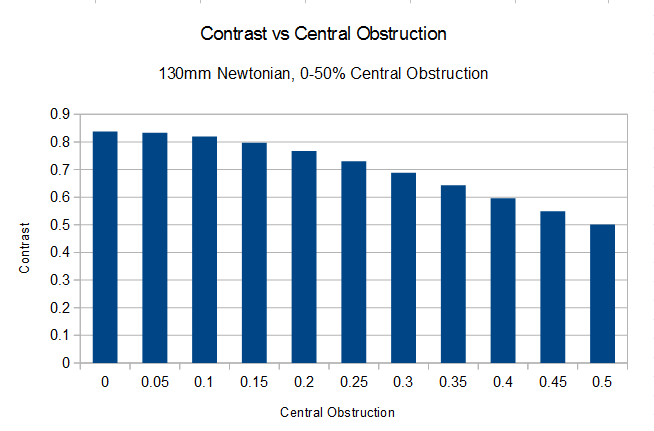 The following graph shows the drop in contrast as the central obstruction increases. Contrast is calculated as the ratio of light in a 1 arcsecond radius circle to that in a radius of 30 arcseconds.